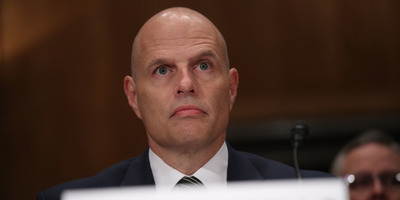 The Senate Homeland Security and Governmental Affairs Committee chose to delay a vote on President Trump’s nominee to lead ICE. Ronald Vitiello had shared images on Twitter comparing Trump to cartoon character Dennis the Menace during the 2016 presidential campaign. A group of unions sent a letter to the committee addressing concerns about Vitiello’s attitude toward Trump. A key Senate committee delayed a vote on Wednesday for President Donald Trump’s nominee to lead the Immigration and Customs Enforcement (ICE), amid concerns over his record. One of the reasons the Senate Homeland Security and Governmental Affairs Committee delayed the vote on Ronald Vitiello are concerns about his opinion of Trump, particularly since he once shared an image on Twitter that compared the then-presidential candidate to cartoon character Dennis the Menace. On Wednesday, the Washington Post reported that a group of unions sent a letter to the committee addressing their concerns and referencing the tweet about Trump looking like Dennis the Menace. “The nominee to be considered by the Committee, Mr. Ronald D. Vitiello, has only been with ICE for a short period of time, and while this letter neither supports nor opposes his nomination to be our Director, we are aware of several matters that give us serious concern about him,” the unions wrote. Wisconsin Sen. Ron Johnson, who chairs the committee, said a vote could come as soon as Thursday after the delay this week. Nominations expire at the end of the year if the Senate takes no action.